In the Hollow of a Wave off the Coast at Kanagawa (from Thirty-six Views of Mount Fuji) by Katsushika Hokusai. Color woodcut, 10 × 15 inches; Metropolitan Museum of Art, New York. Katsushika Hokusai (葛飾北斎) (1760 – May 10, 1849) was an Edo period Japanese artist, painter, wood engraver and maker of ukiyo-e, author of the 13-volume sketchbook Hokusai manga (begun in 1814) and the block prints Thirty-six Views of Mount Fuji, (created around 1823–1829), which includes In the Hollow of a Wave off the Coast at Kanagawa. He is still considered one of the outstanding figures of the ukiyo-e ("pictures of the floating world;" pictures of the transient pleasure-seeking world of theaters, restaurants, teahouses, courtesans, and geishas) school of printmaking. During his life, Hokusai produced over thirty thousand book illustrations, theater programs, paintings, and color prints. His best work was produced when he was over 50 years old, and he continued to create beautiful prints until his death at the age of 89. Hokusai incorporated European elements such as landscape perspective and realism into traditional Japanese styles to produce exciting new images. His art was an important source of inspiration for many European impressionists like Claude Monet, Edgar Degas, Henri de Toulouse-Lautrec, Vincent van Gogh, and Paul Gauguin, and American artist James McNeill Whistler. Hokusai was born at Honjo Warigesui, in Katsushika of Shimosa Province, very close to old Edo (now Tokyo) in the ninth month of the tenth year of the period Horeki (October-November, 1760) to an artisan family. Hokusai called himself "the farmer of Katsushika" and often used Katsushika in place of his family name. His father, Nakajima Issai, was a mirror-polisher for the Tokugawa shogunate. At 15 Hokusia began an apprenticeship at a woodcut workshop, and at 18 he entered the studio of Katsukawa Shunsho, a painter and designer of ukiyo-e color prints. He took the name of Katsukawa Shunro and, under Shunsho’s guidance, designed mostly actor prints and book covers. He remained loosely connected to the art school of Katsukawa Shunsho for 14 years, but was expelled from the Katsukawa Art School after Shunsho's death in 1792 for diverging from the new master's aesthetic principles. During this period he also learned from Kano Yusen, Tsutsumi Torin, and Sumiyoshi Naiki, and studied the European copper-plate engravings that were being smuggled into the country. He was also influenced by Shiba Kokan (1747–1818), one of the first Japanese artists to study Western realism and landscape perspective. He began to introduce these elements into his work, developing an independent style of his own. During his life Hokusai produced perhaps as many as thirty thousand book illustrations, theater programs, paintings, and color prints. He often drew inspiration from ordinary Japanese life, traditions, and legends. Around 1798, he began landscape painting; it was during this period that he gave the name Sori to his most promising pupil and took for himself the name of Hokusai. He began to observe and sketch everything around him. In 1814, he began publishing a series known as the Hokusai Manga (sketchbooks), which eventually developed into 15 volumes. In 1824 he published the book New Forms for Design, and his designs have inspired many Sashiko quilting patterns. From about 1826 to 1833, he was engaged in creating and publishing the epoch-making series of woodblock prints known as The Thirty-six Views of Mount Fuji. Hokusai was completely involved in his art, working from early morning until after sunset. He was energetic and restless, and by his own account changed his residence 93 times during his life. He used at least 22 different pseudonyms to sign his work, a circumstance which has created considerable confusion for collectors and art historians. His personal life was a difficult one; his first wife died in 1793, leaving him with a son and two daughters. He remarried in 1797, but in 1812 his eldest son died. His two daughters had unhappy marriages, divorced and returned to their father’s house. Hokusai adopted the son of his eldest daughter, but the boy was a disappointment. In 1828, his second wife died. Hokusai produced his best works after the age of 60. His most typical wood-block prints, silkscreens, and landscape paintings were done between 1830 and 1840, when he was in his 70s. Even after reaching the age of 80, he produced many fine prints. He often expressed his desire to live beyond the age of 90, and just before he died on April 18, 1849 at the age of 89, he sighed and said his last words, "If heaven gives me ten more years," he paused, then continued, "or an extension of even five years, I shall surely become a true artist." He died May 10, 1849. From the age of six I had a mania for drawing the shapes of things. When I was 50 I had published a universe of designs. But all I have done before the age of 70 is not worth bothering with. At 75 I'll have learned something of the pattern of nature, of animals, of plants, of trees, birds, fish, and insects. When I am 80 you will see real progress. At 90 I shall have cut my way deeply into the mystery of life itself. At one hundred I shall be a marvelous artist. At 110 everything I create; a dot, a line, will jump to life as never before. To all of you who are going to live as long as I do, I promise to keep my word. I am writing this in my old age. 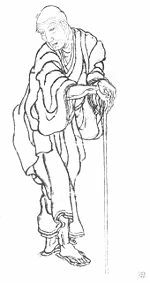 I used to call myself Hokosai, but today I sign myself 'The Old Man Mad About Drawing.—Hokusai. Hokusai’s most popular work is the ukiyo-e series Thirty-six Views of Mount Fuji (富嶽三十六景 Fugaku Sanjūrokkei), which was created between 1826 and 1833. It consists of 46 images (ten of them added later). These became masterpieces in the history of Japanese landscape pictures, and were considered to be most typical of this style of pictorial representation. Hokusai produced outstanding pictures of almost every kind of subject, including flowers, birds, and scenery from legends and everyday life. Some of his paintings were public spectacles which measured over two thousand square feet (two hundred square meters). Perhaps his most recognized work is the woodblock "In the Hollow of a Wave off the Coast at Kanagawa." The scene is of a great wave about to devour men along with their boats, with the distant Mount Fuji minimized by the size of the wave. It is said to be a snapshot picture of a day of labor; one can see surprised men on barges, carrying fish. 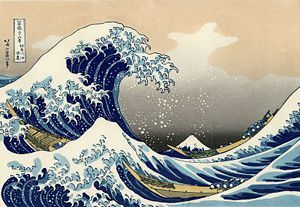 The waves in this work are sometimes mistakenly referred to as tsunami (津波), but they are more accurately called okinami (沖波), great off-shore waves. The largest of Hokusai's works is the 15-volume collection Hokusai Manga (北斎漫画), a book crammed with inventive sketches that was published in 1814. Its caricatures are often considered the precedent to modern manga. 45th in the series, Travellers Crossing the Oi River. Ukiyo-e and woodblock art were a product of the urbanization which took place in Japan starting in the 1600s. Urban centers developed their own culture of popular entertainment, and the rise of a merchant class created a commercial market for certain types of art, so that the artists were no longer financially dependent on traditional patronage. There was a demand for novelty and humor, and artists were quick to experiment with new styles and new techniques. Hokusai and other ukiyo-e artists studied copper engravings of Dutch landscapes and began to incorporate certain elements, such as landscape perspective, realism, and a wider choice of subject matter from all classes of society. Some of the characteristics of Hokusai’s works that were so admired in Europe were actually developments inspired by European art. After Hokusai’s death, copies of some of his woodblock prints were sent to the West, along with the works of other ukiyo-e artists. Many works of Japanese printmakers were imported to Europe, especially Paris in the mid-nineteenth century. They were collected and popular among impressionist artists such as Claude Monet, Edgar Degas, and Henri de Toulouse-Lautrec, whose works bear signs of influence by Japanese art. The work of ukiyo-e artists influenced such Western masters as Vincent van Gogh and Paul Gauguin, who developed a style called Japonaiserie. Calza, Gian Carlo. Hokusai. Phaidon. 2004. Forrer Matthi. Hokusai. Prestel Publishing. 2001. Ray Deborah Kogan. Hokusai: The Man Who Painted a Mountain. Farrar, Straus, and Giroux (BYR). 2001. Yonemura Ann. Hokusai. Freer Gallery of Art and Arthur M. Sackler Ga. 1st edition. 2006. The Hokusai Museum Foundation. The Hokusai Museum. This page was last modified on 12 January 2018, at 15:32.